Although I delight in exotic and spicy cuisines, I do occasionally enjoy one of the great European standards — like this one! It’s a relatively simple recipe that you can prepare in about half an hour, give or take. There are few recipes in the global culinary repertoire that provide more elegance and flavor for so little effort. The recipe here comes from Giada de Laurentiis, but there are other variations. After initially sautéeing the chicken, many people deglaze the pan with white wine and chicken stock, whereas for the sake of convenience I used only a vegetable broth prepared from a powder. With this kind of exquisite dish, we need to talk about side dishes and wine pairings. Tonight I served this with fresh asparagus and cherry tomatoes, tossed with extra-virgin olive oil and broiled for about 8-10 minutes until crisp-tender. If you want a starch, I’d recommend roasting some fingerling potatoes, which would nicely soak up the lemon-butter sauce. This dish demands a crisp white wine. I served it with a Sancerre; a Chablis would also do nicely. Season chicken with salt and pepper. Dredge chicken in flour and shake off excess.In a large skillet over medium-high heat, melt 2 tablespoons of butter with 3 tablespoons olive oil. When butter and oil start to sizzle, add 2 pieces of chicken and cook for 3 minutes. When chicken is browned, flip and cook other side for 3 minutes. Remove and transfer to plate. Melt 2 more tablespoons butter and add another 2 tablespoons olive oil. When butter and oil start to sizzle, add the other 2 pieces of chicken and brown both sides in same manner. Remove pan from heat and add chicken to the plate. (Note: I use a large cast-iron skillet, which accommodates all the chicken in one batch. If you are so fortunate, you can forgo the second dollop of butter and olive oil. 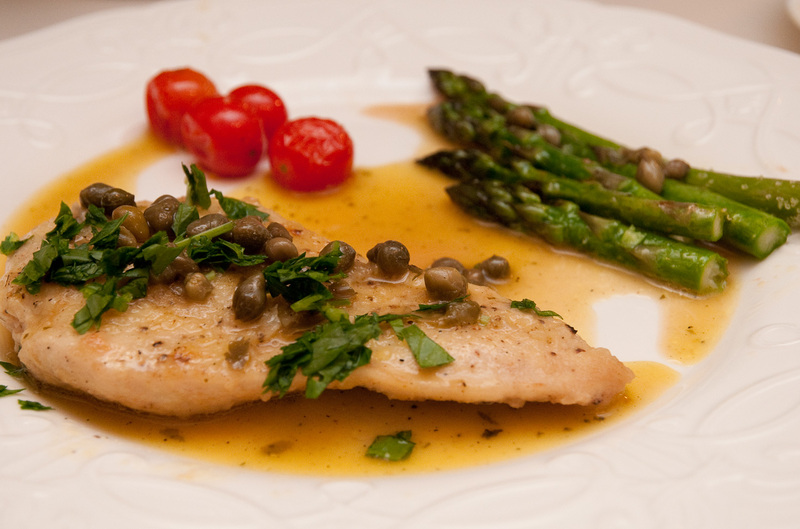 )Into the pan add the lemon juice, stock and capers. Return to stove and bring to boil, scraping up brown bits from the pan for extra flavor. Check for seasoning. Return all the chicken to the pan and simmer for 5 minutes. Remove chicken to platter. Add remaining 2 tablespoons butter to sauce and whisk vigorously. Pour sauce over chicken and garnish with parsley. This entry was posted in Main Courses and tagged Chicken by Baron. Bookmark the permalink.